Combination of 6 different types of saw blades can meet daily use needs, which will help you to accomplish your work better. Made of excellent manufacturing technique and high quality material , Vtopmart saw blades can give you efficient cutting experience. A great selection of oscillating saw blades for cutting wood,plastics, soft metals ,bi metals and other materials. Universal quick release saw blades can be used on numerous oscillating tools. 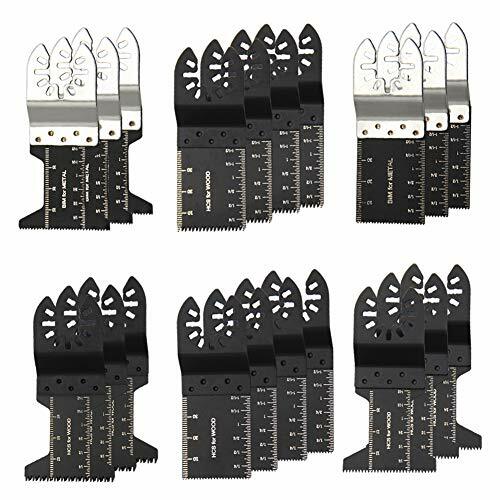 Package Includes: 3 Pack --- 1-3/4-Inch Wood/Plastic/Soft Metal saw blades 3 Pack --- 1-3/4-Inch Precision Wood and Plastic saw blades 3 Pack --- 1-3/4-Inch Bi-Metal saw blades 3 Pack --- 1-3/8-Inch Bi-Metal saw blades 4 Pack --- 1-3/8-Inch Wood/Plastic/Soft Metal saw blades 4 Pack --- 1-3/8-Inch Precision Wood and Plastic saw blades Fitment note: Blades in this listing are compatible with the following brands and models of oscillating multi-tools:Bosch Multi-X, Bosch (except MX30) , Craftsman Nextec Multi Tool, Craftsman Nextec 17438, Craftsman Nextec 61199, Craftsman Nextec 5910, Craftsman 2702 2.0 Amp, Chicago 67256, Chicago 67537, Chicago 67538, Chicago 67707, Chicago 68303, Cougar, DeWalt , Dremel Multi-Max (will not fit MM40 & MM45 models), Driving Force, EINHELL, Falke Tool Mate, Fein Multimaster Tools, Fein Multimaster AFMM 14, Fein Multimaster FMM 250 Q,Fein MultiMaster FMM 250 Q-MS, Fein MultiMaster MOX 6-25 Pneumatic, Ferm Zwolle Holland, Genesis Multi-Purpose, HARDIN AZ318-2 250W, Haussmann 5-in-1 Multi-Purpose Tool, Ideenshop, IIT, King Canada, LongActive, Mastercraft, Master Mechanic, Matrix, MEEC Tools, Millarco prof, Milwaukee, Ozito, Power Craft, Power Duro, Pro-Line, Ridgid Jobmax, Rockwell Sonicrafter Hyperlock. 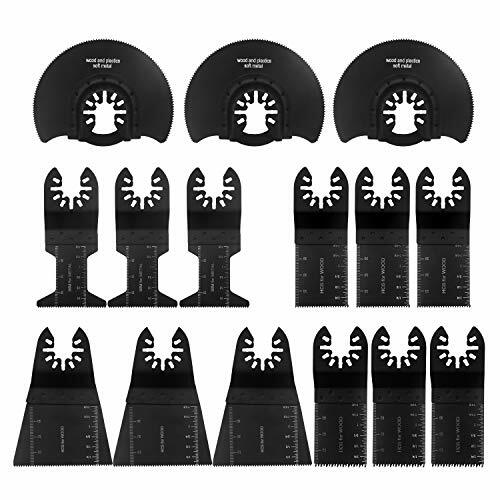 Superior Value Oscillating Saw Blades kit--20 Pcs contain 6 different kinds of saw blades, for cutting wood, metal plastic and other materials, each type of saw blade is specific for a particular purpose. Our oscillating saw blades can meet a variety of needs, which could be used for workshop ,household or other place. Tougher and Thicker Than Most--Made of alloy steel and high carbon steel , our oscillating multitool blades are manufactured with special techniques and thick gauge metals due to which it becomes durable for a long period. Special Design for Precision cutting--Built-in length markers on two sides, one side is inch and other is centimeter, ensure you can get accurate cuts easy and fast while you working with it. 2 kinds of special design precision saw blades have longer wavy tooth that is specifically designed to provide faster, cleaner cuts in wood and plastic. Customer Satisfaction Guaranteed--We provide 100% Satisfaction Guarantee! If you are not satisfied with your oscillating saw blades for any reason, please don't hesitate to contact us, we will take care it for you immediately. Product Features Combination of 5 different types of saw blades can meet daily use needs, which will help you to accomplish your work better. Made of excellent manufacturing technique and high quality material , Vtopmart saw blades can give you efficient cutting experience. A great selection of oscillating saw blades for cutting wood,plastics, soft metals ,bi metals and other materials. Universal quick release saw blades can be used on numerous oscillating tools. 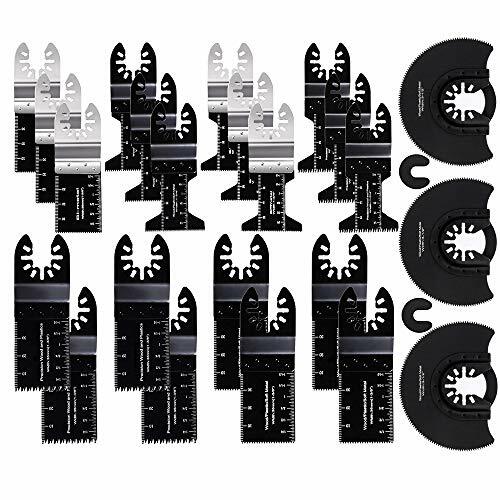 Package Includes 3 Pack --- 1-3/8-Inch Wood/Plastic/Soft Metal saw blades 3 Pack --- 1-3/8-Inch Precision Wood and Plastic saw blades 3 Pack --- 1-3/4-Inch Bi-Metal saw blades 3 Pack --- 2-1/2-Inch Wood/Plastic/Soft Metal saw blades 3 Pack --- 3-1/2-Inch Wood/Plastic/Soft Metal saw blades Compatible with following oscillating tools: Bosch Multi-X, Bosch (except MX30) , Cougar, DeWalt , Dremel Multi-Max (will not fit MM40 & MM45 models), Driving Force, EINHELL, Falke Tool Mate, Fein Multimaster Tools, Fein Multimaster AFMM 14, Fein Multimaster FMM 250 Q,Fein MultiMaster FMM 250 Q-MS, Fein MultiMaster MOX 6-25 Pneumatic,Master Mechanic, Matrix, MEEC Tools, Millarco prof, Milwaukee, Ozito, Power Craft, Power Duro, Pro-Line, Ridgid Jobmax, Rockwell Sonicrafter Hyperlock. Do not fit Fein Starlock Bosch MX30, Bosch Quick Release tools Adapter required for Fein Supercut, Dremel MM40 & MM45 . Include 5 Kinds of Blades----Our oscillating saw blades kit includes 5 different kinds of saw blades. We all know that the secret to getting the most out of a multi-tool, especially when it comes to cutting, is using the right blade. Each type of our saw blades is specific for a particular purpose, which can can meet a variety of needs. Tougher and Thicker Than Most--Made of alloy steel and high carbon steel , our oscillating tool blades are manufactured with special techniques and thick gauge metals due to which it becomes durable for a long period. Special Design for Precision Cutting--Built-in length markers on two sides, one side is inch and other is centimeter, ensure you can get accurate cuts easy and fast while you working with it. The special design precision saw blades have longer wavy tooth that is specifically designed to provide faster, cleaner cuts in wood and plastic. Fit a Large Selection of Oscillating Tools--Our quick release saw blades are compatible with many oscillating tools in the market, such as Fein Multimaster, Ryobi, Milwaukee, Hitachi, Black & Decker, Chicago, Craftsman, Dewalt, more tool compatibility please consult product description. : Not compatible with Fein Starlock. : Adapter required for Fein Supercut. : Not compatible Dremel or Bosch Quick Release tools. : Adapter required for Rockwell & Worx (except Hyperlock). HIGH QUALITY AND SUPERIOR TECHNIQUE Made of High Carbon Steel and Stainless Steel, Thick gauge metals and high-quality manufacturing techniques ensure superior wear tolerance and life. PERFECT FOR ACCURATE PRECISE CUTTING Use the built-in markers - inches on one side, millimeters on the other - to quickly & accurately gauge the depth of your cutting. Manufactured with a durable cutting edge that resists wear and cuts quickly. 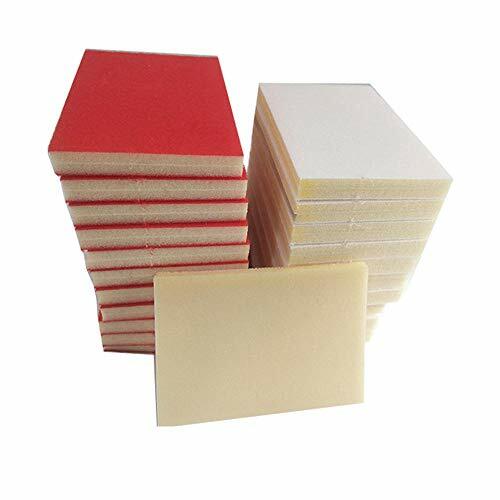 COMPATIBLE FOR VARIOUS OF MATERIALS Function: Ideal for demolition, plumbing, remodeling, and general wood and soft-metal cutting like lite gauge copper, lite gauge metal mesh, and light gauge sheet metal and other soft metallic and non-metallic materials. Does NOT fit Dremel MM40, MM45, Bosch MX30, Rockwell Bolt On and Fein Starlock. Crafted with stronger steel & welds, our premium saw blades cut better & last longer yet cost less than most other brands. 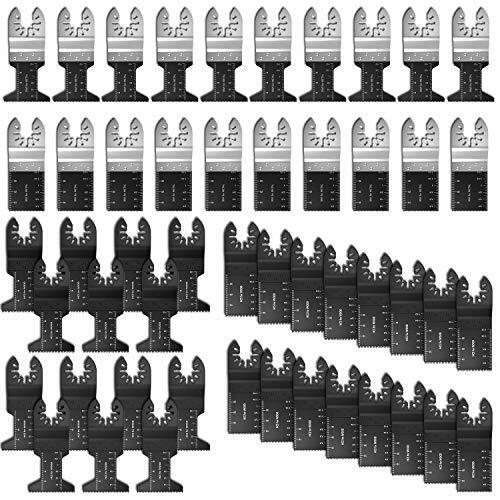 15-piece set fits most oscillating multitools - see list below. All at an affordable price... much less than you'd pay for comparable brand-name blades. CLEAN CUT EVERY TIME ... whether it's metal, wood, plastic, or fiberglass. Paired with a powerful tool, the Ryker Hardware oscillating saw blades provide a reliably precise and swift cut for work you can be proud of. OUTPERFORMS OVERPRICED BLADES ... The Ryker Hardware oscillating saw set contains 15 different blades for every cutting task without sacrificing quality. A hard to beat money-to-value ratio. COMPATIBLE WITH MOST TOOL BRANDS ... 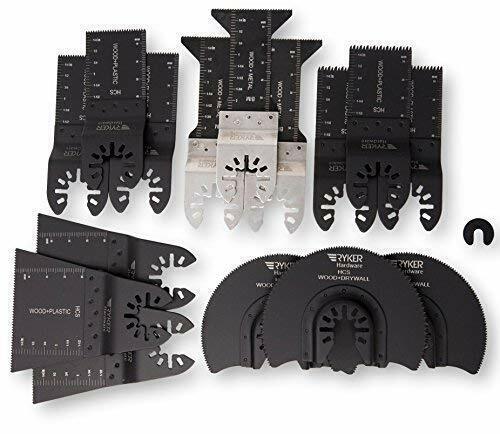 This blade set is compatible with the majority of the oscillating saw tool brands such as DeWALT, Milwaukee, Makita, Ryobi, Ridgid, Porter Cable, and many more. BUILT-IN DEPTH PRECISION MARKERS ... you can use for delicate cuts with accuracy down to 1 millimeter. Both the metric and imperial measuring systems are shown for users around the globe. BLADE PROTECTING CARRY CASE ... The Ryker Hardware oscillating saw set includes a carrying case for travel to & from job sites without cutting anything! It also keeps the blade sharp for longer. 1-pack 3-1/2 in. (87mm) semi-circular saw blade for wood / drywall cutting. Fitment note: Not compatible Dremel or Bosch Quick Release Star-lock tools. 23 metal and wood saw blades in total, manufactured with a durable cutting edge that resists wear and cuts quickly. Fits with Ridgid / Black & Decker / Dewalt / Milwaukee / Skil / Chigago Electirc / Parkside/ Rockwell / Einhell / Porter Cable / Worx / Craftsman multi tool, more tool compatibility please consult product description. Fitment note: Not compatible with Dremel MM44/MM45 models, Bosch OIS tools, Makita xmt03z 18V. Not compatible with Bosch Quick Release Star-lock tools or Fein Star-lock tools. Combination of 50 pcs saw blades can meet daily use needs, which will help you to accomplish your work better. Made of excellent manufacturing technique and high quality material , Vtopmart tool blades can give you efficient cutting experience. A great selection of oscillating saw blades for cutting wood,plastics, soft metals and other materials. Universal quick release saw blades can be used on numerous oscillating tools. Bosch Multi-X, Bosch (except MX30) , Craftsman Nextec Multi Tool, Craftsman Nextec 17438, Craftsman Nextec 61199, Craftsman Nextec 5910, Craftsman 2702 2.0 Amp, Chicago 67256, Chicago 67537, Chicago 67538, Chicago 67707, Chicago 68303, Cougar, DeWalt , Dremel Multi-Max (will not fit MM40 & MM45 models), Driving Force, EINHELL, Falke Tool Mate, Fein Multimaster Tools, Fein Multimaster AFMM 14, Fein Multimaster FMM 250 Q,Fein MultiMaster FMM 250 Q-MS, Fein MultiMaster MOX 6-25 Pneumatic, Ferm Zwolle Holland, Genesis Multi-Purpose, HARDIN AZ318-2 250W, Haussmann 5-in-1 Multi-Purpose Tool, Ideenshop, IIT, King Canada, LongActive, Mastercraft, Master Mechanic, Matrix, MEEC Tools, Millarco prof, Milwaukee, Ozito, Power Craft, Power Duro, Pro-Line, Ridgid Jobmax, Rockwell Sonicrafter Hyperlock. 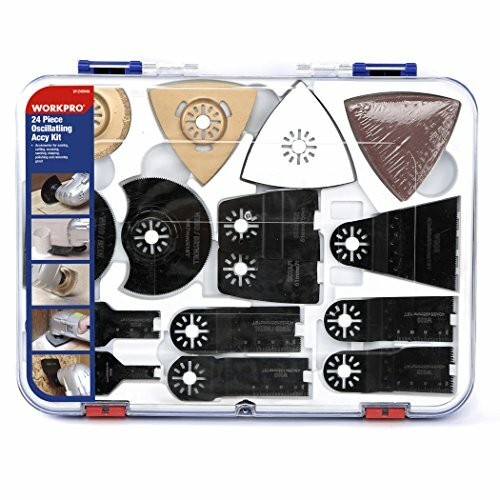 Superior Value Oscillating Saw Blades kit--Contains 50 pack oscillating tool blades, for cutting wood, soft metal and plastic. These oscillating saw blades can meet a variety of needs, which could be used for workshop ,household or other place. Built-in Markers--Built-in length markers on two sides, one side is inch and other is centimeter, ensure you can get accurate cuts easy and fast while you working with it. Customer Satisfaction Guaranteed - If you are not satisfied with your oscillating saw blades for any reason, please don't hesitate to contact us, we will take care it for you immediately. Tougher and Thicker Than Most - Made of alloy steel and high carbon steel, manufactured with special techniques and thick gauge metals, durable for a long period use. Special Design for Precision cutting - Built-in length markers on two sides, one side is inch and other is centimeter, ensure you can get accurate cuts easy and fast while you working with it. 2 kinds of special design precision saw blades have longer wavy tooth that is specifically designed to provide faster, cleaner cuts in wood and plastic. The DEWALT DWA4216 Oscillating 5-Pc. Set is designed with UNIVERSAL FITMENT for use on all major brands of oscillating tools (no adapter required). 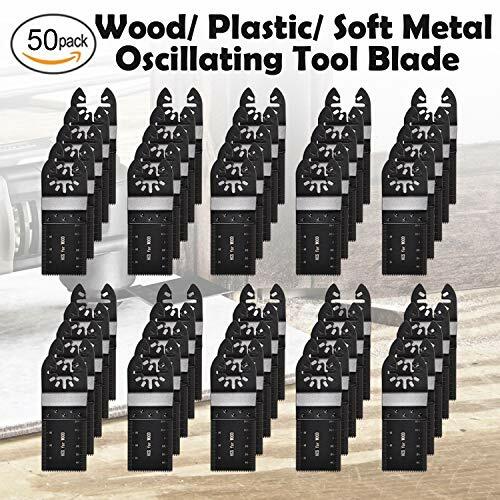 This is a variety set of blades for multiple applications and the Tough Case is versatile and allows user to customize compartments to fit a wide variety of oscillating accessories. Includes (2) DWA4203 Oscillating Wood w/Nails Blade - designed for wood cutting, (1) DWA4206 Oscillating Fastcut Wood blade - designed for fast cuts in wood, (1) DWA4213 Oscillating Flush Cut Blade - designed for flush cuts on a variety of applications and (1) DWA4217 Oscillating Rigid Scraper Blade - designed for scraping applications. Included: 1/4 inch bi-metal end cut saw blade, 3/8 inch wood end cut saw blade, 3/4 inch wood end cut saw blade. 1/8 inch wood end cut saw blade, 3/8 inch wood end cut saw blade, 3/8 inch precision wood end cut saw blade, 2PC 5/8 inch wood saw blade 3PC 1/2 inch wood /metal segment saw blade. 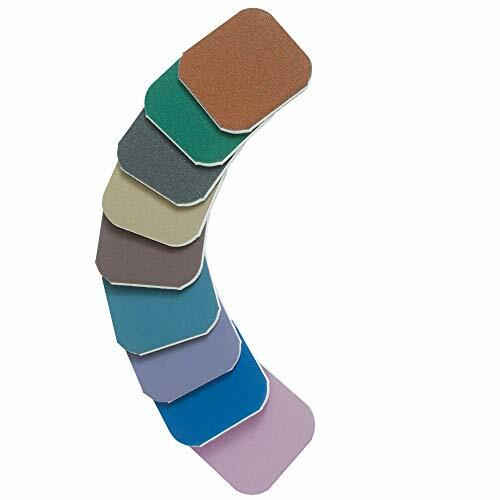 3PC 1/2 inch wood / drywall segment saw blade, 3 inch triangular carbide grout removal rasp, 2PC 1/2 inch grout removal blade Flexible scraper blade, Rigid scraper blade, 3 inch sanding pad (10) 3 inch sandpaper for wood. Compatibility: Not compatible with blade quick release or quick change tools, not compatible with Black&Decker BD Matrix, Rockwell Sonicrafter, Dewalt DCS355, Dremel MM40, 45, WORX 20V Max. 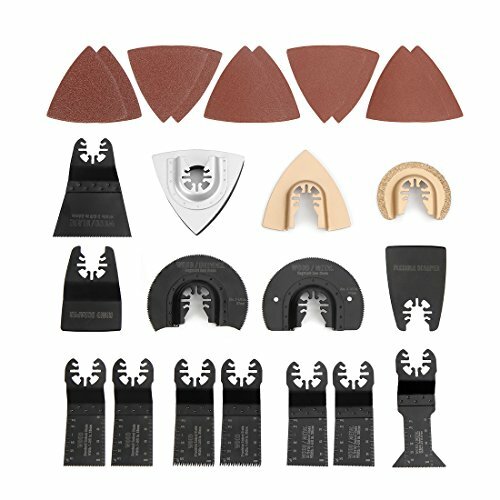 24-Piece Oscillating Accessory Kit: This high quality kit contains wood/ metal end cut blades, sanding pad, carbide blade, grout removal rasp and scraper. Various Applications: The accessory set can be used while doing home repairing, such as sawing or cutting metal/wood/plastic, sanding hardwood, removing paint, rasping and grinding cement and so on. Case for Easy Carrying: The kit comes with a durable transparent plastic case for well organize, storage and easy carrying. Customer Satisfaction Guaranteed: We provide 100% Satisfaction Guarantee! If the accessories you bought can't match the tools you already have , please feel free to contact us, we will solve your problems immediately. QBit SQ1000-S Outlet Box Saw Blade for Oscillating Power Multi-Tools to Cut-in Single Gang Wall Boxes ------ Are you tired of over cutting your drywall using a reciprocating or drywall saw? ------ Are you looking for a better way to make Single-Gang cut-outs for retrofit wall boxes? The SQ1000-S will Cut-in exact rectangular-holes in seconds. --- If your job requires you to cut-in wall boxes in drywall, the QBit is for you. --- Fits on virtually all Oscillating Power Multi-Tools and turns it into a hole making machine! --- Unlike a drywall saw which leaves unsightly ragged edges, the QBit makes a perfect hole every-time and it does so quick and efficiently! American Engineered & Made in the USA. We highly recommend that you invest in this tool! 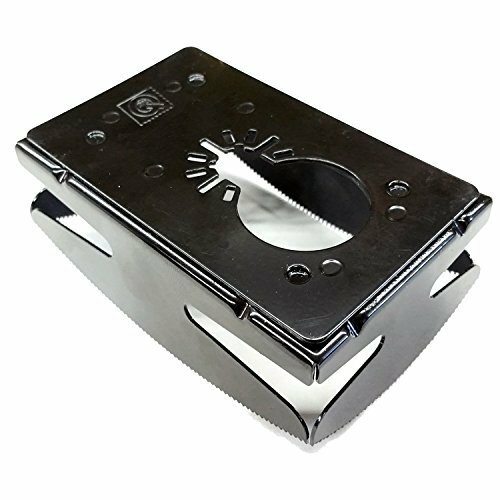 ------ PERFECT FOR: Anyone who needs to make single gang rectangular-holes in drywall for wall boxes, including: High and Low-Voltage Tech - electricians, telephone, data, alarm/security, CCTV/IP-camera, antenna, cable, dish, home-theater, automation, HAVC, Drywall Contractor/Installer, Etc.------ *NOTE: QBit was designed to fit all popular Oscillating Tool such as DeWalt, Milwaukee, Bosch, Fein, etc. If your Multi-Tool has a different connection type on it, Bosch makes a little adapter (OIS001B) for less than $4 that allows you to adapt to the standard size (which we don't stock or sell). ------ Does NOT include: Oscillating Power Multi-Tool or adaptor, which is only pictured to display how the tool works. ------ WARNING: Always wear approved eye protection. All Trademarks Belong to Their Respective Companies. QBit SQ1000-S-LV Outlet Box Saw Blade for Oscillating Power Multi-Tools Specifically Designed to Cut-in Low Voltage Single Gang Brackets ------ Are you tired of over cutting your drywall using a reciprocating or drywall saw? ------ Are you looking for a better way to make Single-Gang cut-outs for retrofit wall boxes? The SQ1000-S-LV will Cut-in exact rectangular-holes in seconds. --- If your job requires you to cut-in wall boxes in drywall, the QBit is for you. --- Fits on virtually all Oscillating Power Multi-Tools and turns it into a hole making machine! --- Unlike a drywall saw which leaves unsightly ragged edges, the QBit makes a perfect hole every-time and it does so quick and efficiently! American Engineered & Made in the USA. We highly recommend that you invest in this tool! ------ PERFECT FOR: Anyone who needs to make single gang rectangular-holes in drywall for wall boxes, including: High and Low-Voltage Tech - electricians, telephone, data, alarm/security, CCTV/IP-camera, antenna, cable, dish, home-theater, automation, HAVC, Drywall Contractor/Installer, Etc.------ *NOTE: QBit was designed to fit all popular Oscillating Tool such as DeWalt, Milwaukee, Bosch, Fein, etc. If your Multi-Tool has a different connection type on it, Bosch makes a little adapter (OIS001B) for less than $4 that allows you to adapt to the standard size (which we don't stock or sell). ------ Does NOT include: Oscillating Power Multi-Tool or adaptor, which is only pictured to display how the tool works. ------ WARNING: Always wear approved eye protection. Brand: Qbit | Manufacturer: Labor Saving Systems Ltd.
Do you want to avoid paying a fortune buying name brand replacement blades? Meet The Oscillating Multitool Saw Blades By Littlegrass: The Only Value Back That Combines Quality & Quantity! Made from heavy duty Steel , these blades ensure superior wear tolerance and great durability. 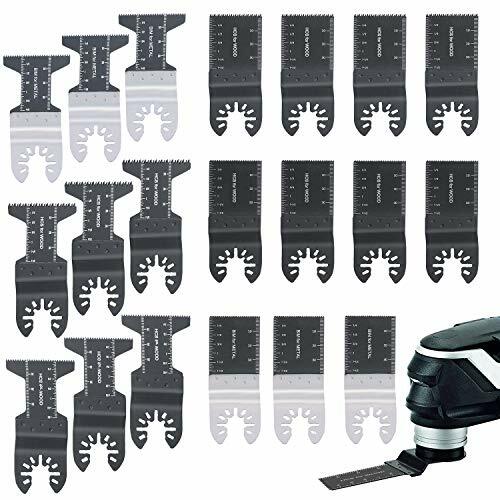 Function: Ideal for demolition, plumbing, remodeling and general wood and SOFT-METAL cutting like lite gauge copper, lite gauge metal mesh, and light gauge sheet metal and other soft metallic and non-metallic materials. Oscillating saw blades are made of High Carbon Steel and Stainless Steel,Thick gauge metals and high quality manufacturing techniques insure superior wear tolerance and life. Not compatible with Fein Starlock. For Wood Only. Made of High Carbon Steel and Stainless Steel, these strong oscillating multitool saw blades work great on wood and plastic. 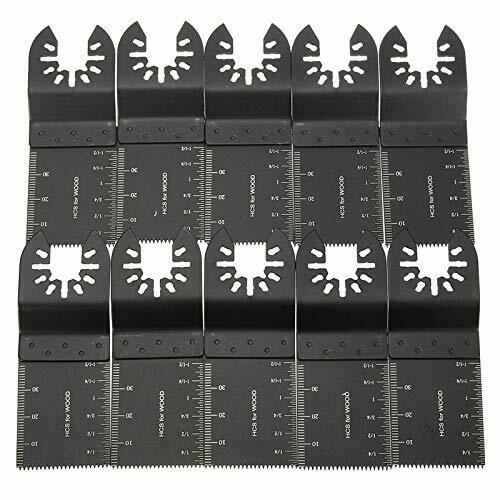 10 PCS saw blades set Include Standard tooth and Japanese tooth .A great selection of blades for cutting wood,plastics, soft metals and more. You can choose the right one for your cutting purpose and it fits most of universal machine . Built-in depth markers on sides, allow you to make accurate cuts fast and easy every time. SATISFACTION GUARANTEED --- DIAGTREE release cutting wood,soft metal blades are made from the best high gauge, heavy-duty metals, and are tuned for performance. If you're not happy with your blades for any reason, the manufacturer offers a 100% Money Back Guarantee. Not compatible with Bosch MX30, Dremel MM40/MM45. Not compatible Dremel or Bosch Quick Release tools. Adapter required for Rockwell & Worx(except Hyperlock). Adapter required for Fein Supercut. Not compatible with Fein Starlock. Contact us anytime for any issue. We are confident about our products. ...Click"Add to Cart" and buy the Professional Oscillating Multi Tool today. 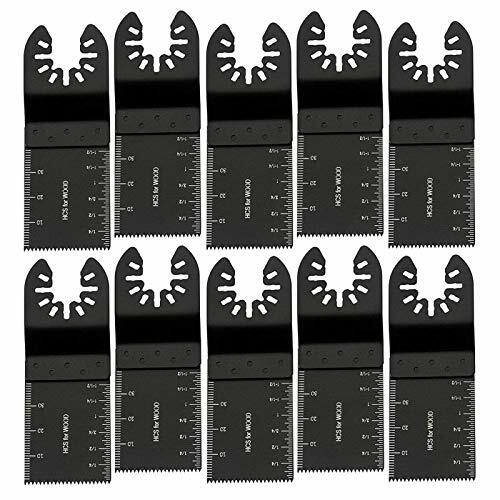 25 Pcs Oscillating saw accessories -- Include 7 different types of saw blades can meet daily use needs, which will help you to accomplish your work better. Made of high quality material -- Made of excellent manufacturing technique and high quality material, Cozzmts saw blades can give you efficient cutting experience. Multifunctional -- A great selection of oscillating saw blades for cutting wood,plastics, soft metals ,bi metals and other materials. A total of 25 metal and wood saw blades made of alloy steel and high carbon steel, our oscillating blades are made of special technology and thick gauge metal. It provides you with an efficient cutting experience and is therefore durable in the long term. The built-in length markings on both sides, one inch on one side and centimeters on the other, ensure that you can get accurate cuts quickly and easily when you use them. Adapter required for Rockwell & Worx(except Hyperlock). A total of 25 metal and wood saw blades, including 7 different types of saw blades, are available for everyday use, which will help you get the job done. Made of high-quality materials - Made of alloy steel and high carbon steel, our oscillating inserts are made with special technology and thick gauge metal to provide you with an efficient cutting experience and long-term durability. Versatile - The fast blade release mechanism is suitable for most quick release systems as well as the old hexagonal screw system for cutting wood, plastic, soft metals, bimetals and other materials. Acoala Wood/Metal Oscillating Saw Blades for Quick Release Multi Tool--- Help You to Accomplish Your Work Better! Use for cut wood, plastics, soft metals ,bi-metals and other materials. [Made Of High Quality Material]--Our oscillating multitool quick release saw blade construction includes both Bi-Metal and HCS. All blades are constructed by steel of high quality, heat treated and electrophoretic black coating for strength and durability as well as rust resistance. 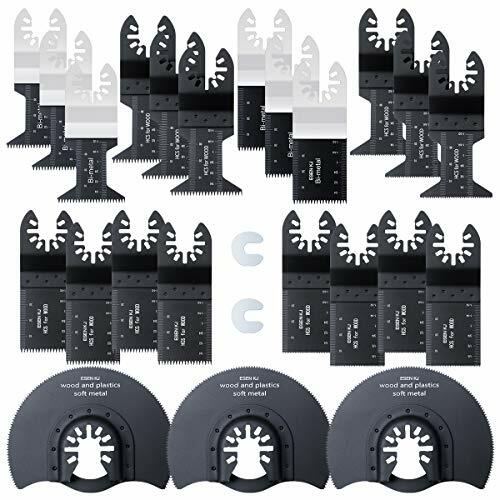 [Superior Value Oscillating Saw Blades Kit]--Total 20pcs. Combination of 6 different types of oscillating saw blades for daily use needs, which will help you to cut wood, plastics, soft metals ,bi-metals and other materials easier and better. Each type of saw blade is specific for a particular purpose. [Built-in Length Markers On Two Sides]-- Built-in SAE&metric scale on both sides, which provides accurate cutting. Set includes standard cutting tooth and precision cutting tooth blades for various selection. [Universal Quick Release System]--The saw blades is designed with quick release blade mechanism for conveniently assem and change, which is suitable for most quick change Oscillating tools as well as those with old hex screw system. 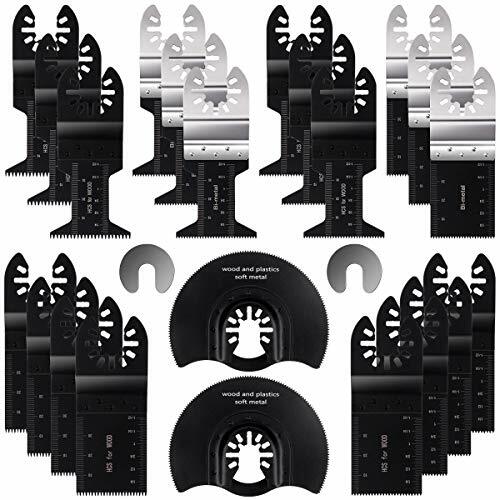 [Compatible With Most Tool Brand]-- Acoala oscillating saw blades set for quick release multitool, fits with universal multi-tool such as Fein Multimaster, Ryobi, Milwaukee, Hitachi, Black & Decker, Chicago, Craftsman, Dewalt and More. ( Do NOT fit Dremel MM40,MM45,Dremel Multi Max 6300,Bosch MX30 ). [PROFESSIONAL MATERIAL SPECIAL DESIGN AND USE]-It's made of alloy steel and high carbon steel.Built-in length markers on two sides,one side is inch and other is centimeter.Special design accessories for sawing,cutting,scraping,sanding,shaping,polishing and moving grout. [PROFESSION SELECTION OF TOP BLADES]-Set includes standard tooth,Japanese tooth and precision tooth blades for various selection. [100%RELIABLE HUICOCY CUSTOMER SERVICE]-Reliable and friendly customer service within a 24hrs time frame.We promise ONE YEAR WARRANTY AND MONEY BACK.We would reach out directly soon if you meet any issues-huicocy@163.com. 50-Pack: Standard Saw Blades are included. For even the toughest projects or fussiest materials,such as soft metal, wood, plastic, the universal fit metal and wood cutting blades do the trick. Improvement:The innovative blades and beveled-tooth design makes them the perfect option when looking for wood or soft metal cutting blades and for aggressive plunge cutting. 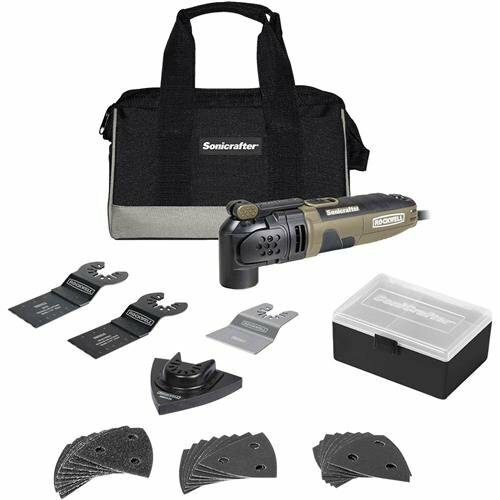 This set includes multiple metal and wood cutting blades so you can be sure to have the right oscillating tool accessory to tackle any project. 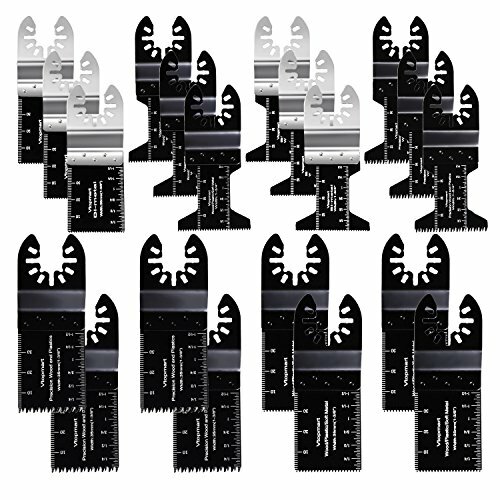 Our multi tool blades will go right through most building materials easily and accurately, letting you make deep plunges in wood, particle board, drywall, plastics, and soft metals. You can make straight, longer cuts or very intricate cuts with this exceptionally versatile and reliable tool. We are committed to providing our customers with efficient and durable multitool blades. New segment circular and fine tooth saw blades can help cut wood quickly, and bi-metal can cut nails accurately. Not compatible with Bosch MX30, Dremel or Bosch Quick Release tools, Rockwell & Worx (except Hyperlock), Fein Supercut, Fein or Bosch Starlock. 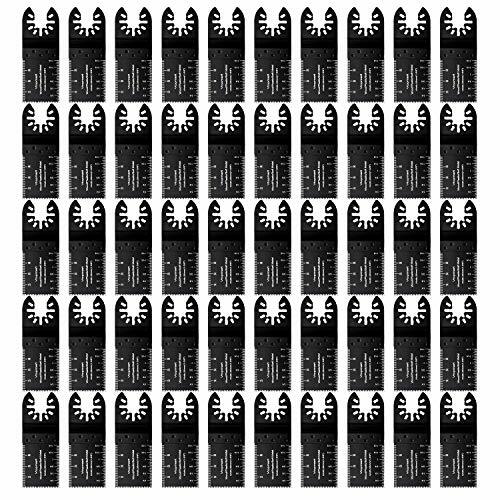 Our oscillating tool blades come with 12 months guarantee, if you are not satisfied with your purchase for Any Reason, please feel free to contact us, we are more than happy to help. 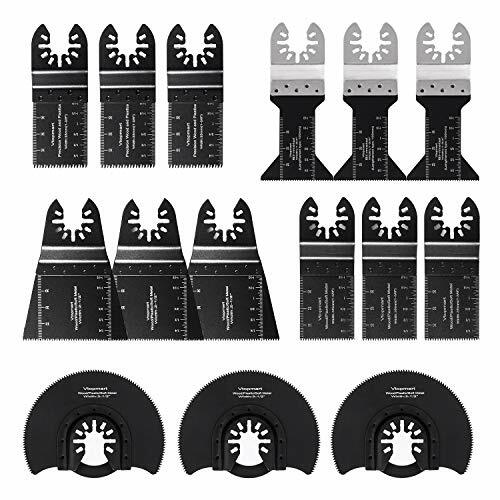 Oscillating Saw Blades Set 3pcs3-1/2 "HCS Wide Segment Multitool Blade, 3pcs 1-3/4" Bi-Metal Oscillating Tool Blade, 3pcs 2-5/8" HCS Fine Tooth Multitool Blade, 3pcs 1-3/8-Inch Soft-Metal Saw Blades, 3pcs 1-3/8Inch Precision Japan Tooth Oscillating saw blades, 5 different kinds of oscillating saw blades provide you with professional choices for cutting wood, metal, plastic and drywall. 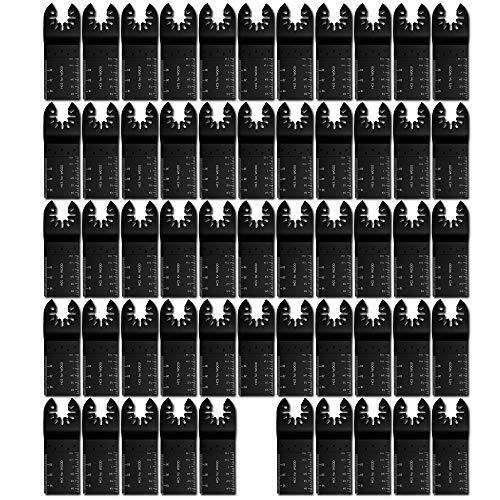 Precise Cutting Built-in depth markers on sides with accuracy down to 1 millimete. Whether it's soft metals, wood, plastic, or fiberglass, ensure you can get accurate cuts easy and fast while you working with it. The special design precision saw blades have longer wavy tooth that is specifically designed to provide faster, cleaner cuts in wood and plastic. Sturdy You Can't Think Of Made of alloy steel and high carbon steel , our oscillating tool blades are manufactured with special techniques and thick gauge metals due to which it becomes durable for a long period. Customer Satisfaction Guaranteed 30 Day Money Back Guarantee for all new unused product returns. We provide 100% Satisfaction Guarantee! If you are not satisfied with your oscillating saw blades for any reason, please don't hesitate to contact us, we will take care it for you immediately. 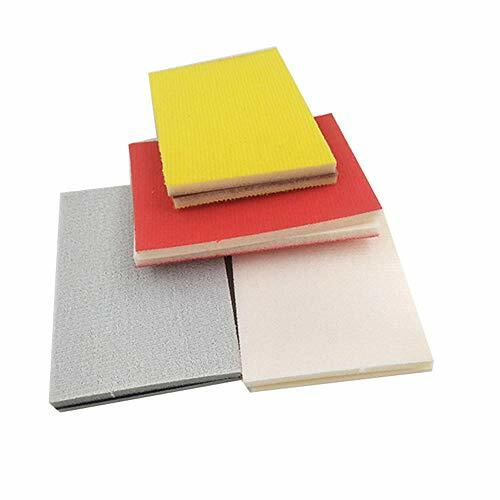 Suitable for model structures (plastic models: pre-grinding and polishing), cell phone cases, plastic models, nails, jewelry, musical instruments (guitar, piano). Why pay $10-$15 per blade? We are specialized in producing all kinds of Oscillating Tool Blades products factory, and export to many countries. Our saw blades match & exceed name-brand quality at a fraction of the price : The Only Value Back That Combines Quality & Quantity! Fitment note: Not compatible with Bosch MX30, Dremel MM40/MM45 Dremel or Bosch Quick Release tools. Fein Starlock. Fitment note: Adapter required for Rockwell & Worx (except Hyperlock). Fein Supercut. 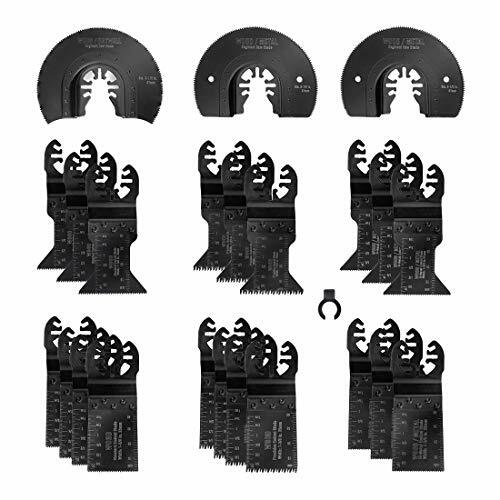 Kit of 15 Mixed Saw Blades & Accessories. Function: Ideal for demolition, plumbing, remodeling and general WOOD METAL AND NAIL cutting like lite gauge copper, lite gauge metal mesh, and light gauge sheet metal and other soft metallic and non-metallic materials. Oscillating saw blades are made of High Carbon Steel and Stainless Steel,Thick gauge metals and high quality manufacturing techniques insure superior wear tolerance and life. Fit Most Quick Release system as well as old Hex Screw system, Fein Multimaster, Porter Rockwell Cable ,Black & Decker ,Bosch Craftsman ,Ridgid Ryobi ,Makita Milwaukee ,Dewalt, Chicago ,etc.If you have any question about our product, please feel free to contact us!